Voice controls are one of the hottest trends in home automation and Leviton has comprehensive, low cost solutions to control your lighting with simple voice commands. Leviton’s Decora® Z-Wave® lighting control products work with the Samsung SmartThings™ Hub and Amazon Echo to control your home’s lights with simple commands. 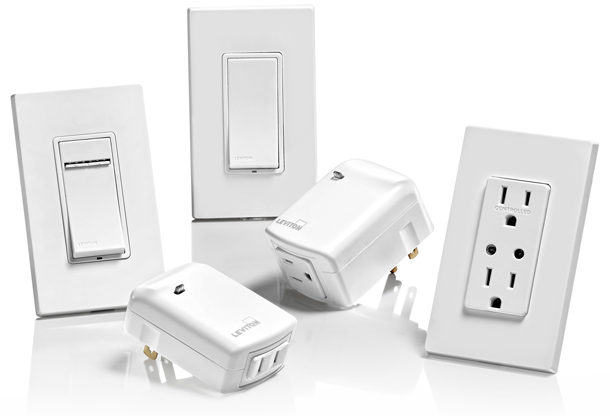 SmartThings’ capabilities with the Amazon Echo, Fire TV, Echo Dot® and Amazon Tap allow you to connect to Leviton smart controls and use your voice to control lights or anything plugged into a Leviton outlet or plug-in module such as table lamps, fans and small appliances. Dim lights to create lighting scenes for any environment including dinner parties, romantic evenings and more! Leviton Z-Wave eliminates the need for tiresome manual operation of lights using functionality and technology and works with a variety of devices to control lights, motor loads and appliances. Leviton Z-Wave products offer contemporary style and convenience for one touch or voice command lighting control, scheduling and remote access from your smartphone or tablet.